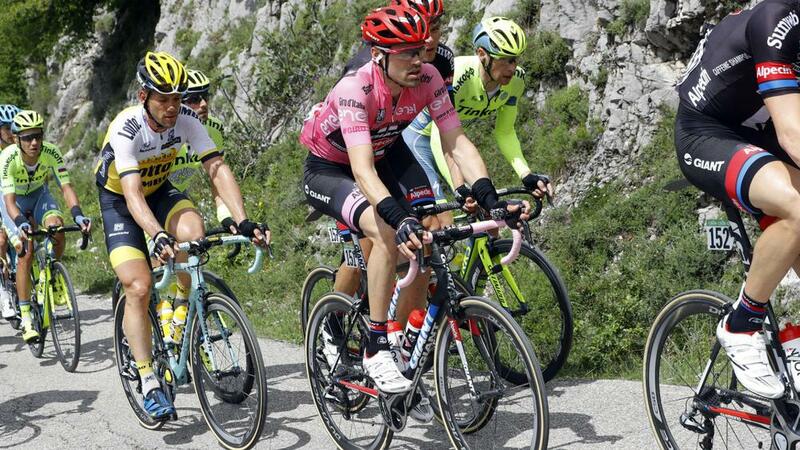 Vincenzo Nibali's failed attack in the final kilometres of stage six of the Giro d'Italia encouraged Tom Dumoulin to make an unplanned charge which resulted in him taking fourth. Giant-Alpecin rider Dumoulin reclaimed the pink jersey from Marcel Kittel at stage four and enhanced his lead with a powerful finish on Thursday. The Dutchman was in the main bunch until general classification rival Nibali made a failed push for the finish line. That encouraged Dumoulin to change his plan and make a break, extending his advantage to 26 seconds despite missing out on a time bonus by finishing outside the top three. "I hadn't planned to attack. If I see a possibility I go for it. This was a climb that suited me. You need to have the legs but I had them today," he said at the finish line. "When Nibali attacked, I suffered, but then when he came back I went for it. You've got to follow the moment. "I noticed that Nibali was struggling on the flatter section and so I thought I'd go for it. I really surprised myself today. "Now I'm riding for the general classification but we'll see what happens. I honestly didn't really think it would go so well." The stage was won by Lotto-Soudal rider Tim Wellens, who capped an impressive ride with a powerful break from the leading pack on the final climb. However, he revealed it was Dumoulin who suggested he make an initial move away from the peloton after the descent midway through the ride closed the gap to the leaders. "It's a very, very special win for me. I've got thank the belief of the team and thanks to Dumoulin who let us get away. Tom came to me and said it was an ideal moment to attack," said Wellens. "[Team-mate] Pim [Ligthart] then came to me and we pulled through. We were all well down overall and we got plenty of space. That surprised me, but sometimes you need a little luck. "On the final climb I felt that I was the strongest and I so I went for it."